Today, Facebook rolled out a new commenting system for blogs and third-party sites. We’ve implemented it here on TechCrunch, and after a few hours of the system being live it is obvious that it has its share of pros and cons. Readers have certainly noticed, and there is already a ton debate about whether this is good or bad for the Internet. It is certainly not perfect. Facebook comments don’t support Twitter or Google logins. It doesn’t yet allow sites to archive their comments to make backups (although an API for that is forthcoming I am told), and switching away from Facebook comments after a few months on the system looks like it will be a hassle (data portability anyone?). Some corporations block Facebook, which kills it as a commenting system for that subset of users. In one fell swoop it could hurt Disqus, which is a great startup that’s been perfecting its commenting system for years. And there are lots of little bugs we’ve noticed that hopefully will be fixed soon (we were manually moderating every comment on TechCrunch until a few minutes ago, and you still can’t see a comment count at the top of each post like you could before). On the other hand, it also has some real advantages. Primary among these is that it requires commenters to use their real identities. In the past few hours, most of the anonymous trolls who have come to call TechCrunch comments a second home are gone. Of course, some people don’t want to comment with their real names for good reason (they want to speak freely without fear of reprisals), but for the most part in practice anonymity was abused. It was used mostly as a shield to hide behind and throw out invective. Have the trolls really vanished or will they return? I certainly hope they are gone. We have fewer comments in general on most posts today, but the conversations are much more civil and interesting. The other main benefit is social virality. When you comment on TechCrunch, your comment also appears in your Facebook stream with a link back to the post (unless you opt out of that option in the comment box). It would be better if the link went right to your comment instead of to the post in general, but that is a feature that can be added. It brings in more readers from Facebook who are pulled in to see what their friends said. So what are the results? So far today, Facebook is our No. 2 referring site, after AOL (thank you, Justin Bieber). It is beating out Twitter, which is usually our top source of referring traffic. This viral effect would be twice as powerful, of course, if people could use their Twitter IDs as well. Real names and identities greatly reduces the number of trolls and anonymous cowards in comments. Social virality boosts traffic by creating a feedback loop between Facebook and participating sites. 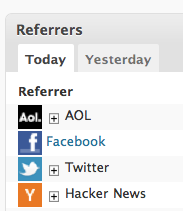 Friends pull in their friends, creating a social entry point to your site. Automatic sign-in if you already signed into Facebook elsewhere, lowers the barriers to commenting. Most “liked” comments get voted to the top. It also knows who your friends are, so you will see those comments first. No support for Twitter or Google IDs, which leaves out the other half of the social Web. No backups and other lock-ins will make it hard for sites to leave. If you work somewhere that blocks Facebook, you are out of luck. Your friends might be surprised to find their replies in your Facebook News stream reproduced on another site’s comments. Expect a backlash. Moderation bugs, no view counts at the top of posts or ways to highlight site owners/writers in comments. What do you think are the biggest pros and cons?